Editor’s note: In honor of the University’s 225th anniversary, unc.edu is sharing profiles throughout the academic year of some of the many Tar Heels who have left their heelprint on the campus, their communities, the state, the nation and the world. 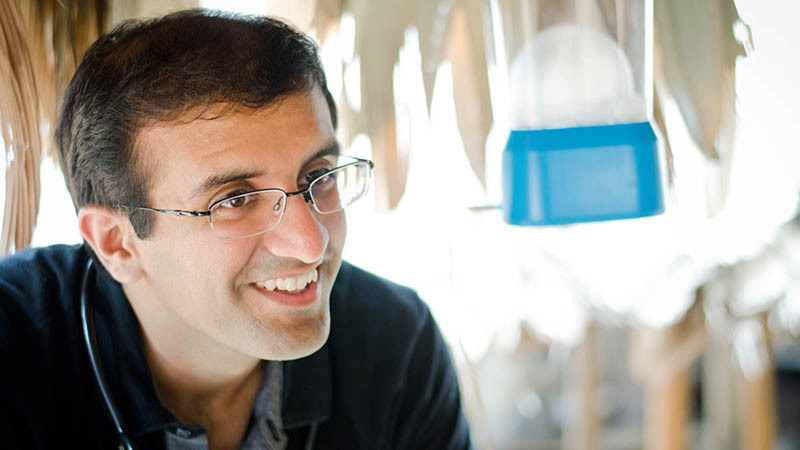 Raj Panjabi served as Campus Y co-president during the 2001-2002 academic year. He credits faculty members like Virginia Carson, the Campus Y’s former Executive Director, with pushing him to make the impact he has today. As civil war erupted in his home country of Liberia, Raj Panjabi climbed onto a rescue cargo plane with his family and fled the destruction that would claim hundreds of thousands of lives. He was just nine years old. Years later, when Panjabi enrolled in the UNC School of Medicine, he did so with the intent of one day returning to Liberia to bring healing to his first home. As Liberia slowly recovered from years of violence and political instability, Panjabi saw a way he could contribute. With his medical school training from Carolina, he could work with others to train community members to become health workers in remote parts of Liberia’s rainforest to treat the common ailments of their neighbors that, without proper treatment, often result in death. As soon as he graduated in 2007, Panjabi and his wife Amisha Raja, who graduated from Carolina in 2002, started Last Mile Health, an organization dedicated to saving lives in the world’s most remote communities. Its goal is ensure a health worker is within reach for everyone, everywhere by equipping community members to provide care to their neighbors in remote communities. Panjabi credits Carolina for giving him the courage to take a risk — a risk that has paid off, resulting in more than 3,000 community health workers and clinical supervisors who are now trained to provide life-saving care to people in need, as well as a growing global focus for the organization. “We would not have had the boldness to take on Last Mile Health had it not been for the experience and opportunities UNC offered me,” he said. In 2018, Carolina named a “Bridge Builder” scholarship after Panjabi. Bridge Builders are individuals whose work, advocacy and personal example helped forge a more inclusive, unified and aspirational Carolina community.